The Avebury monument is a Neolithic site situated approximately 20 miles from the more famous monument Stonehenge. Like Stonehenge, Avebury is made mostly of large stones. In the case of Avebury, the stones are smaller and spread wider. The monument consists of both standing stones and other stones arranged in circles. There is also a much larger ring of stones encircling the other stone structures, which is itself encircled by an embankment. No one knows why the monument was built, though, as with Stonehenge, there are many theories. The site has not been excavated since the 1930s and is now designated as a World Heritage Site. In this new effort, the researchers sought to learn more about the monument by using modern technology rather than digging. To learn more about the history of the monument, the researchers went back to the work done by the team in the 1930s, and then scanned the area beneath one of the inner circles using ground-penetrating radar. They report that they found a square stone structure not far below the surface with walls approximately 30 meters long. They report also that the square structure was built around another structure, which closer study revealed to be a Neolithic house. 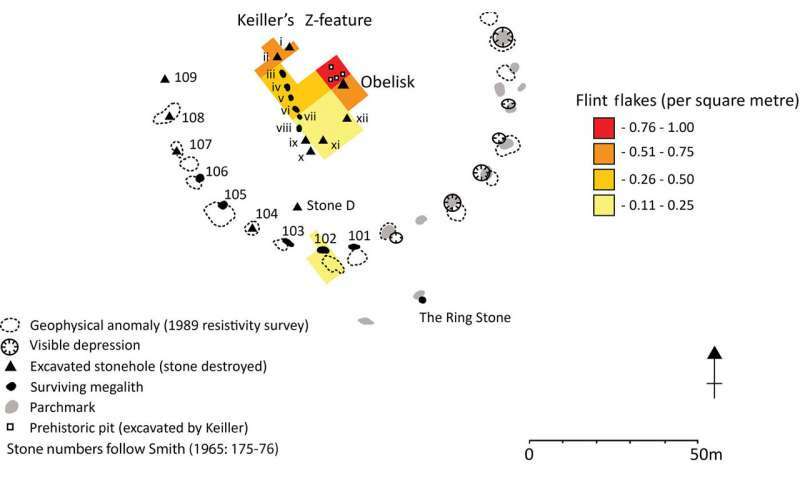 They note that the earlier team had found flint tools near where the house was located. They claim that the evidence suggests that the house was built sometime around 3700 BC. They also found evidence suggesting that the stone square around the house was added later, as were the circles of stone that enclosed them both. They theorize that the site began as a simple abode for a single family, but was deemed special by those who came later. Those later arrivals apparently treated the house as a shrine after its inhabitants had passed on, and built the rings and other structures to honor them. The number of messianic figured found throughout history is staggering. Wouldn't be surprised for this too to be another example. Must have been Merlinus' old place.